Situated in a peaceful, secluded area in the South of Mahe and about twenty minutes from the International Airport, surrounded with greenery and exotic species of vegetation from which its name is derived. The two self-catering chalets are strategically positioned, within minutes of two beautiful beaches, Anse Royale and Anse La Mouche. Both chalets boast breathtaking mountain and sea views. Within walking distance from the establishment is a selection of supermarket and shops where guests can buy provisions. The first chalet has three, double air-conditioned bedrooms, a large lounge, dining room and well-equipped country kitchen. It accommodates six adults and is ideal for families or groups of friends. The second chalet has one double air-conditioned bedroom, a lounge and a well equipped kitchen/dining room to accommodate two adults. 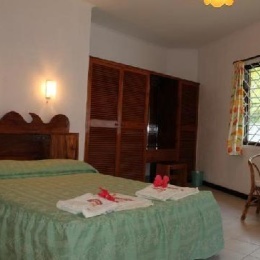 All bedrooms have en-suite bathrooms and are spacious and tastefully decorated. Both chalets can be booked jointly for larger groups.